Get Excavation Safety Certification Online Now! Excavation and working in trenches include some of the most dangerous situations in all of construction. If you’re planning on being an excavator or working in a trench for an upcoming job, it’s essential that you are well-versed in excavation safety. Employers want to see that you take excavation seriously: it’s time to take care of your excavation safety ticket right now. How Do I Get My Excavation Safety Certification Card? Ready to get your excavation safety certification card in Alberta or any other province for an upcoming job? Good news — there’s never been a better time to take care of your excavation training in a way that’s convenient, interesting, and gets you ready and compliant for your next job! At the end of our approximately 120 minute course, you’ll simply print out your certificate and excavation safety ticket as proof of full completion of your excavation safety training requirement. What are you waiting for? 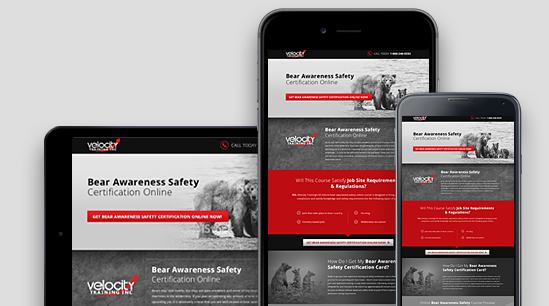 Take care of your Excavation Safety certification quickly and easily with a fun, engaging online course from Velocity Training!